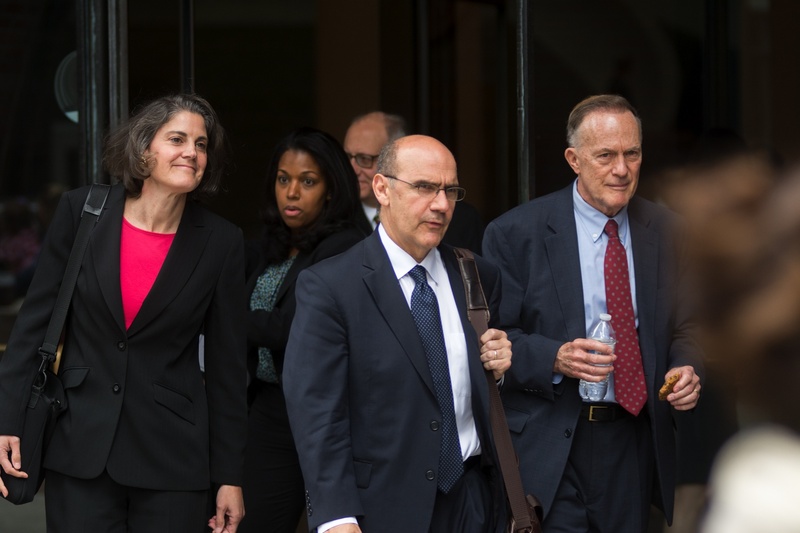 Harvard's long-serving Dean of Admissions and Financial Aid William R. Fitzsimmons '67 (far right) exits the courthouse during the admissions trial. Higher education fundraising experts are divided over whether the Harvard admissions lawsuit will impact donations — though some big-ticket donors say the litigation won’t change their giving patterns. Harvard’s high-profile admissions trial wrapped up in a Boston federal courtroom Friday after 15 days of argument. 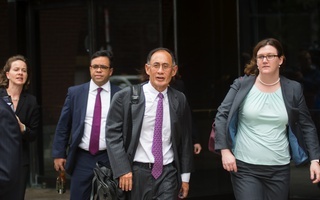 The trial was the latest development in a four-year-old lawsuit filed by anti-affirmative action advocacy group Students for Fair Admissions, which alleges Harvard discriminates against Asian-American applicants. Whichever way Judge Allison D. Burroughs rules, the losing party plans to appeal the verdict — likely all the way to the Supreme Court. With conservative Supreme Court Justice Brett Kavanaugh now on the bench, experts predict the court could strike down affirmative action in college admissions entirely. 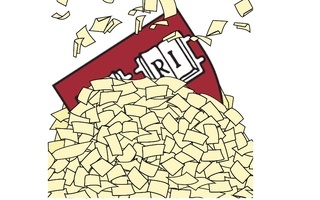 The lawsuit has revealed many once-hidden details about how Harvard admits students. Among other revelations, documents released in court showed that the University gives significant admissions preferences to children of wealthy donors. These applicants — whom the College places into two selective groups dubbed the “dean’s list” and “director’s list” — see an acceptance rate nine times higher than the overall rate. University President Lawrence S. Bacow said in an interview last week he could not quantify the donations Harvard receives from alumni whose children benefited from these admissions preferences. “I honestly don’t know the answer to that and, even if I did, I probably couldn’t say it right now given that the case is in trial,” he said. Asked whether Harvard has seen an uptick in donations in light of this revelation, University President Lawrence S. Bacow again declined to comment. “I couldn’t tell you,” he said. 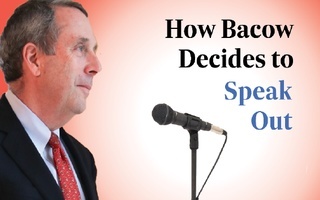 Bacow said that he does not receive frequent updates on donations. Higher education expert Thomas D. Parker '64 said elite universities have always given children from wealthy backgrounds an edge in their admissions processes — partly to sustain their donor base. “These aren’t revelations that are coming out of this,” he added, referring to the lawsuit. Robert Moore, an executive at the Council for Advancement and Support of Education, said it is too early to predict the effect the lawsuit may have on giving. He also said he is unsure how Harvard’s development team will talk about the lawsuit with donors. Moore pointed to other schools involved in controversies that have bounced back from negative perceptions — though he noted he “cannot project” if the same will hold true for Harvard. Parker raised the point that a Supreme Court ruling striking down Harvard’s race-conscious admissions policy may actually boost donations if Harvard opts to defy the ruling and keep its admissions process, risking federal funding. Parker speculated that this string of events might motivate donors to give to the University to offset the loss of federal funds. But, he added, it would be tricky to make up the hundreds of millions of dollars per year Harvard receives from the government. Michael T. Kerr '81, a former co-chair of the Harvard College Fund Executive Committee, said he anticipated the lawsuit will have no effect on current donors, since many of the alumni support the school’s efforts to diversify its student population. Asked whether the lawsuit against Harvard would change his giving to the University, Paul A. Buttenwieser ’60, a former Crimson editor and a former member of the Board of Overseers, answered “not at all.” Buttenwieser also said other donors have told him they plan to stick to their current patterns of giving. “Everybody I have talked to feels that Harvard’s admissions policy is great, Dean Fitzsimmons... [has] brought about much more diversity than Harvard has ever known, all the donors I know are very much in favor of diversity and we see this lawsuit as a challenge to diversity,” Buttenwieser said. —Staff writer Andrew J. Zucker can be reached at andrew.zucker@thecrimson. com. Follow him on Twitter @AndrewJZucker.